Honestly, everything in this house is timetabled!﻿ The television, the computer, the bathroom, leaving the house etc etc. So I finally get my hands on the computer to let you all know how I'm coping so far from home. As you can see, I'm surrounded by Englishness! You don't even want to know what the ingredients for that pickle are. Or the "salad cream" either. It doesn't even go on salad half the time, she has it with chips! Which is the proper name for french fries I've been informed. What I call chips are either crisps or for playing poker. I've had my myth-busting hat on and the first one is that "English people are not friendly". I am happy to report English people are very friendly - once they know you. "Knowing you" consists of meeting you for the first time via an introduction from a person they already know. You can't just start chatting to people in the street without a formal introduction. Unless you are an old person in which case you are permitted to make personal comments about babies and pregnant women only. Dog walkers may also exchange nods and "good morning" if they have their dog with them. Life here is very sociable, I've met so many people and drunk so much tea and nibbled so many biscuits I've lost count. My hostess is very busy running the town it seems. The current Government (who are only mentioned via clenched teeth) are very keen on the "community" running things, not central Government. The community seems to consist of my hostess and several retired ladies who my hostess describes as "herself in 20 years time". Her ambition is to join the WI. The first week there was a most enjoyable stitching lesson with a young woman and her baby. The young woman is keen to learn to cross stitch and has already completed a Helen Philipps heart under my hostess's tutelage. They are designing a birth sampler for the said small baby using a number of fairy charts from an issue of Cross Stitcher magazine. My hostess is arranging the charts in a pleasing manner and the young woman will stitch them. Eventually. When they stop running the school. The young woman is chair of the PTA. I feel very old sometimes. She is young enough to be my host's daughter never mind my granddaughter! This weekend has been "finishing weekend". My hostess has the bad habit of reaching the final few stitches and putting the project away instead of getting on and finishing it. So we had a flurry of activity today. First up is the iStitch Mystery SAL all completed and framed in this lovely DMC wooden box which my hostess uses to keep her bead collection in. The details have been blocked out in the top picture to protect the design's copyright. The 2nd picture has been adjusted by Carol but the top one wasn't. In case you were wondering. My hostess will explain the story behind the stitching and the box next time she blogs. These cute cards are from Cross Stitcher magazine, my hostess made a New Year's Resolution to stitch every Cover Kit in the month of receipt. However she hadn't bargained on CS changing it's design brief so much in the course of the year. Far too many of the cover kits have just not appealled to her so she has used other designs to make the most of the materials. Sadly the quality of these has decreased too and my hostess had to ask for replacement cards for this project. The originals were torn and dirty. Shocking. Anyway she stitched these owls from a different issue and decorated the cards using felt-tip pens. She feels the green one needs something more and will source some sticky flowers next week. This delightful design is by San Man Originals from the Spooky SAL board. Hallowe'en is very under celebrated here. We didn't even get a single trick or treater call at the house! Something to do with being at the end of a dark country lane ... This design has been framed with some rather nice ribbon to disguise the fact that the frame is too big. The ribbon comes from the most easterly knitting shop in England. Frankly everything here has the suffix "most easterly" - it seems to be their only claim to fame. They even have the most easterly prison just up the road! I fear my allotted time at the computer is at a close now, I have to go supervise the bathing of the small boy. I must say it has been lovely to be around small children again, my last three hostesses did not supply surrogate grandchildren. Although the little dog did his best with the spinster, frankly she was childlike in behaviour only! hello madam muriel..i can see you are having lots of fun.. So glad your enjoying yourself Madam Muriel! Love the SAL box, the cover kits & The SanMan SAL! Good morning Mme, glad you are enjoying your stay. please tell your hostess that she's done a wonderful job with the box and with the Sanman SAL frame. Sounds like Madame Muriel is having a lovely time in Jolly Old England. Sounds like you're having a wonderful visit. Your hostess has done a great job with her finishes. I especially like the ribbon on the San Man Halloween piece. Do they really say Cheerio??? That's a myth I always wanted to find out if it's true or not. 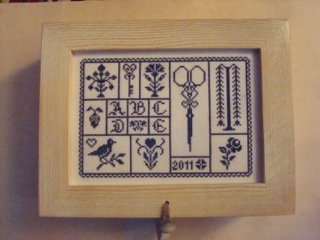 I am so glad you are having a splendid time and I love the DMC box for the finished SAL. Very pretty!!! Gorgeous finish Jo!! I love the box you put Carol's piece on. As for the English "not being friendly" bit, I've never thought that seeing as I've only met friendly English people! !